The Marshall Class 5, now with the option of a head or combo, and low power modes. The Marshall Class 5 combo was released back in 2009, and provided excellent classic Marshall class A tone in a small footprint, and low wattage. Now in 2011 Marshall has released a new version of the Class 5 in both head and combo models. The updated Class 5 still retains the same specifications as the original, but a low power mode control has been added to the back panel. As I am well aware 5 watts is still extremely loud, and without a master volume control the amp needs to be turned right up to get some great heavy gain. The low power mode sets the Class 5’s wattage at 0.1watts, a much more bedroom friendly level. Introducing the latest additions to Marshall’s Class5 family – the Class5 head (C5H), C110 extension cab and the new edition of the critically acclaimed Class5 combo (C5-01). Both all-valve C5-01 and C5H features 5 Watts of power and true Class A circuitry from input to output, producing pure vintage Marshall tone. Created in response to numerous requests for “the sound of a Plexi at a fraction of the size and volume” – the new Class5 range aims to answer those low wattage, big tone prayers! Five Watts of EL84 power and a simple feature set of Volume, Bass, Middle and Treble are the Class5’s secret weapons. In return for minimal amp circuitry you receive genuine Class A tone, widely regarded as the purest in amplifier design and rich in smooth second-harmonic distortion. The all-valve signal path offers a wealth of untainted analogue tones right at your finger tips with sparkling cleans, full-bodied crunch and glorious lead tones just a dial turn away. Both Class5 amps respond naturally to playing dynamics and on-the-fly guitar control adjustments, making for a truly interactive playing experience. All of this amazing Class A tone and low wattage make the C5H and C5-01 the ideal studio/home amplifier. While tone purists can enjoy the authentic all-valve timbre, pedal fanatics and studio engineers alike will find the Class5 provides the perfect sonic foundation on which to build their sound. The new Class5 combo features the custom designed Celestion G10F-15 loudspeaker. This 10″ tone cone equips the C5-01 with fantastic bottom-end clout for an amp of its stature, yet also retains tonal clarity and definition. The rear panel offers both 16 Ohm and headphones outputs, with the latter doubling as the C5-01’s new Low Power Mode. Selecting this option without headphones connected routes the low power signal (about 50mW) directly to the amp’s internal loudspeaker. As a result, this volume is well suited to headphones-free home practice. The C5H offers outputs for both 8 and 16 Ohm extension cabinets, plus a handy headphones socket as well. Of course, every head requires a speaker cab and the new C110 is the perfect tonal partner. This compact 1×10″ extension cab is modelled directly on the C5-01 and contains the same G10F-15 loudspeaker. Aesthetically, the Class5 amps and C110 cab go back-to-basics with cool vintage styling. Both the standard C5-01 and C5H feature Marshall’s archetypal gold panel/black levant livery, with combo and speaker cabinets donning classic “Salt and Pepper” grille cloth*. The entire Class5 range is manufactured and quality controlled at Marshall HQ in the heart of the UK. Every Class5 combo, head and C110 cab is meticulously built and tested by some of the most skilled hands in the business. It’s this precision craftsmanship, together with specially sourced components and materials, that afford the Class5 range the durability you would expect of a Marshall. If you’re looking for a low wattage amp with tonnes of analogue character, unique style and robust build quality then look no further. 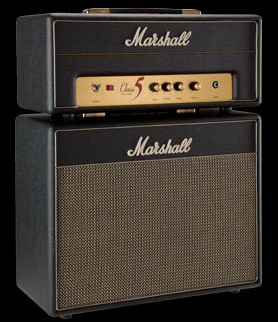 The Class5 range really is all-valve Marshall tone at its best – pure, audacious and inspiring! This is a seriously awesome upgrade to the Class 5. I love that a head can now be bought, and the low power mode is just what the doctor ordered for those wanting nice dirty tones at bedroom friendly volumes. I hope to see Marshall add an effects loop in their next iteration. 2 Responses to "Cool new gear: Marshall Class 5 combo and head"
I’m so tempted by the new combo, with the power reduction switch. But that being said, the head powering a 4×12″ with some Greenbacks would be awesome. The head idea is sweet. I just wish I wasn’t so broke. I’d love one for fun at home. Would be a great match up with my HT-5.